Agroecology and Livelihoods Collaborative (ALC)* at University of Vermont (UVM), in partnership with the Community Agroecology Network (CAN), announce the 18th Annual International Agroecology Shortcourse, Pathways to Resilience: An Agroecological Approach. Agroecology offers crucial tools for farmers, advocates, and planners to transform food systems for sustainability and resilience. 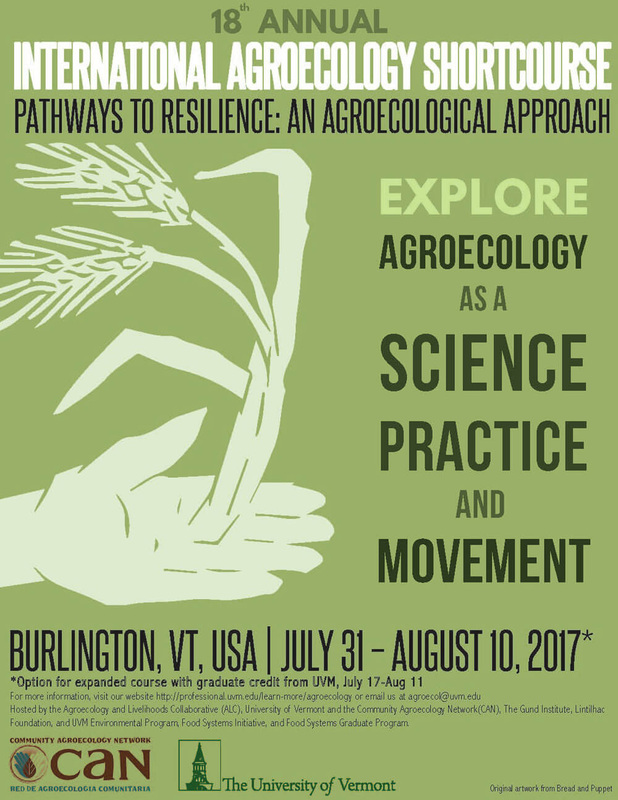 This year’s shortcourse will focus on agroecology as a science, practice, and movement. By drawing on the experiences of participants from all over the world, this course will examine pathways to more resilient agrifood systems at a local, regional, and international scale. Classes and field activities will be held at UVM, situated in the heart of the Champlain Valley, offering the unique opportunity to experience Vermont’s vibrant, local food and agriculture systems. Non-credit training course: An 11-day face-to-face experience at the University of Vermont. Fees are $2,100 (developed country) and $1,800 (developing country), all included (tuition, accommodations, meals and materials). This does not cover travel costs. Dates: July 31-August 10. A UVM 4-credit graduate/upper division summer course. See information below. Option for expanded course for credit: online component July 17- August 18, in-person session July 31- August 10, 2017. More information on registration here. The Agroecology and Livelihoods Collaborative is integrating the 2017 shortcourse as the pilot introductory class for the forthcoming UVM-accredited Certificate of Graduate Study in Agroecology (CGSA). This low-residency program is composed of 1 hybrid course, which includes both face-to-face and online delivery, and 4 online courses. The goal of the CGSA is to provide participants with graduate-level, conceptual and applied knowledge in the field of agroecology. For 2017, the shortcourse described above will count as the introductory hybrid course. This certificate was created as a response to demand for a deeper curriculum that focuses on all dimensions of agroecology, including science, movement and practice. Participants will be able to take the XVIII Annual International Agroecology Shortcourse either as a stand-alone training course, a stand-alone graduate level course for credit, or as the first course required for those wanting to continue on with the CGSA. Non-credit training course: A 10 day face to face experience at the University of Vermont. Final fees still to be determined but usually around $2,000 all included (tuition, accommodations, meals and materials). This does not cover travel costs. Dates: July 31-August 10.